Earwigs or pincher bugs as they are sometimes known can be a real nuisance. They flourish underneath rocks, wood piles, potted plants, and anything they can get under. As you are in your yard moving things around they will scatter. So what do we do? 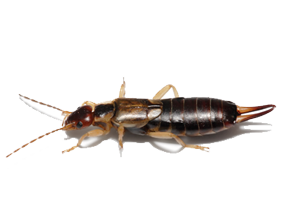 Well our technicians are trained to come out and spray all of the areas where earwigs are found. A good residual pesticide is what is needed to obtain an earwig free home. When we are at your house we will go over some suggestions to help minimize the earwig situation.